Michelle U. Quach stands under a South Vietnamese flag in South Philadelphia. Michelle U. Quach left Vietnam long ago, when she was a child, but on Monday she'll proudly help raise the flag of her homeland in ceremonies at Philadelphia City Hall. Not the official flag of the Socialist Republic of Vietnam. 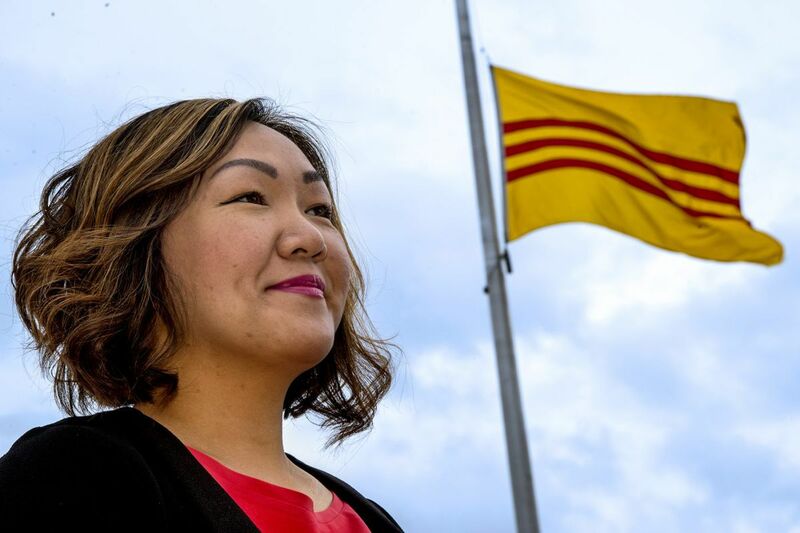 Instead, she'll hoist the banner to which she and other local Vietnamese pledge undying allegiance, the broad yellow field and three horizontal red stripes of South Vietnam — a nation that ceased to exist 43 years ago. "We will never recognize the communist flag," said Quach, 40, of Cherry Hill. "I've learned over the years to dislike the 'Vietnamese' flag, and it's passed on from generation to generation." That loyalty to a vanished homeland is born of a permanent, collective grief, a sorrow and pride branded onto the souls of people who left everything behind in desperate bids for safety and new lives. South Vietnam disappeared from the Earth on April 30, 1975, when Viet Cong and People's Army forces overran the last southern defenses and captured the capital of Saigon, uniting the country and ending what was then America's longest war. Today, April 30 is celebrated in Vietnam as "Reunification Day." People will gather here, too, not to cheer but to mourn the loss of their nation and pay tribute to those who fought for it — and to look forward in the hope that Vietnam and its people will one day be free from communism. "It's emotional, an integral part of all of us," said Theresa Tran, of Lansdale, a pharmaceutical executive who left Vietnam in 1975 at age 11. "As a survivor, it's my responsibility to preserve our heritage and legacy." Heritage is all that's left of South Vietnam. The United States resumed diplomatic relations with Vietnam in 1995. Today, more than 20,000 Vietnamese students study at American universities. U.S. airlines offer daily flights to Hanoi and to Saigon, renamed Ho Chi Minh City by the victors. Tourists can stay at a Hilton hotel, sip coffee at Starbucks, and snack at KFC. But walk the streets of South Philadelphia, particularly around Sixth and Washington Streets, and the past is present. The South Vietnamese flag outside New World Plaza in South Philadelphia. The South Vietnamese flag flies from homes and businesses, at the entrance to New World Plaza, a big shopping center, and at the Bo De Buddhist Temple. At Tet new year celebrations and community events, the South Vietnamese anthem is sung. And that, says Quyen Ngo, an administrator at Philadelphia Community College, is how it should be. He fought with the South Vietnamese Army against North Vietnam — and considers himself a soldier today, having never been formally discharged. "I am still fighting against communist rulers by all means I have," said Ngo, 72, "until my people in Vietnam completely have the freedom to live like us over here in the U.S."
He spent three years at hard labor in a "reeducation" camp, where he and other prisoners suffered hunger and illness, then escaped Vietnam by boat in 1978. He was saved by a merchant ship, taken to Thailand as a refugee, then came to Philadelphia. In that, his journey was painfully typical. Quyen Ngo, outside of Community College of Philadelphia, where he works as an administrator. He fought for South Vietnam as an Army lieutenant and later made his way to the United States. Many local Vietnamese came here as refugees, some of them among the 800,000 "Boat People" who risked their lives at sea in the years after the war. In 1980, Philadelphia had 2,038 Vietnamese. That population more than doubled to 5,701 in 1990, then nearly doubled again to 11,608 in 2000. Today, it stands at 15,965. "There's a rabid anti-communist flavor among some of the older Vietnamese," said former Marines infantry officer Terry Williamson, who fought in Vietnam and now serves as president of the Philadelphia Vietnam Veterans Memorial Fund. "They really carry some grudges." Vietnamese “Boat People” depicted in the Mural Arts Philadelphia mural “The Journey: From Vietnam to the United States,” by Shira Walinsky on an outside wall of the Bo De Buddhist Temple in South Philadelphia. For a long time after reaching the U.S., said Tram Bao Nguyen, she dreamed of Vietnam, of her grandmother who stayed behind. The family lived near Saigon. Nguyen was 8 when her parents told her, in 1980, that they were going on a family trip to a wedding. Instead, over days, they made their way to a boat, boarding in darkness with 40 other people. The boat dragged in silt as it navigated a shallow river. Several men, including Nguyen's father, climbed overboard to push. The boat came free, and passengers told the men to climb back on, calling out their names one by one, so no one would be left behind. Nguyen's father didn't answer. And he couldn't swim. Soon, other men were missing. Their wives and children, hysterical, struggled to keep quiet, knowing that making noise would mean discovery. There was nothing they could do but go on. Eventually the boat reached the ocean, sailing for three days without the occupants have access to food or water. Rescued at sea, the group was moved to a refugee camp in Thailand. About 18 months later, a telegram arrived: Nguyen's father was alive. He had made it out of Vietnam, to Malaysia. The family was reunited in Philadelphia. "At the time, I didn't see it as traumatic," said Nguyen, 45, an advocate at South Philadelphia Victim Witness Services. Remember, she said, some boats left Vietnam crammed with a hundred people — and only a few survived. Her family was fortunate. Mobs of Vietnamese people scale the wall of the U.S. Embassy in Saigon, trying to get to the helicopter pickup zone, as the communists moved on the city and the Vietnam War came to an end. That suffering helps explain why the idea of South Vietnam, and its flag, remains so vital, said Stanford University scholar Fred Turner, author of Echoes of Combat: Trauma, Memory, and the Vietnam War. "It's a reminder for each new generation that becomes more American, 'This is who we were, don't forget who we were ….'" But they are forgetting. Or never knew. "When my parents taught me about what happened in Vietnam, it went in one ear and out the other," said Xena Nguyen, 23, a Temple University student born to refugee parents in South Jersey. "My family is here now, so I don't have any hard feelings about the war, or who won or lost." Her father, Lap Nguyen, left Vietnam on a makeshift fishing boat in 1980. He made it to a refugee camp in Thailand, then to America, where he was joined by his wife, Dung Ho. Today, the front window of their home displays a small South Vietnamese flag. In their car, the flag hangs from the rearview mirror. But the yellow and red hold little meaning for their daughter. "I don't feel patriotic to South Vietnam the way my parents do," said Xena Nguyen, who was named for TV's Warrior Princess. "America is my home." Across the Delaware River in South Philadelphia, it's the same for Quyen Truong, 23, an advertising major at Temple. "I recognized the flag and talked about it with my mom, but it never affected me politically," Quyen Truong said. Her mother, Phi Nga Trinh, left everything in Vietnam when she fled in 1995 among the later departures. The past, she told her children, would not help them build a future. Past, it is. People doubted South Vietnam would survive when the last American combat troops left the country in 1973. And it didn't. Michelle Quach was born two years after the war ended and left Vietnam when she was 10 in 1987. Raising the flag, she said, feels like honoring a lost, beloved relative. It's important, even if not everyone understands. "A lot of people here, until the Vietnamese communists fall, they're not going to return to Vietnam," she said. "That's just the way my community is." At least two public ceremonies will be held to mark the April 30, 1975, fall of Saigon: On Sunday, 11 a.m., at the Philadelphia Vietnam Veterans Memorial at Penn's Landing. On Monday, 10 a.m., at Philadelphia City Hall.